Dreaming of flying? Good news! It’s easier than you think! Make your dream a reality today! Take the controls on your very first flight with one of our highly trained flight instructors giving you instruction. Learn about the airplane during the walk-around preflight inspection. Once the engine starts, it’s all yours with your instructor assisting you during taxi, run up and takeoff. Once in the air, cruise over beautiful northwest NJ, all the while being at the controls of the aircraft and learning basic maneuvers. An experience you’ll never forget! Once on the ground your instructor will debrief you and fill out your logbook (extra) for your first official flight hour! Looking for more performance? Fly our all composite Cirrus SR22, equipped with a state-of-the-art glass cockpit. The Cirrus is also equipped with the only U.S. FAA certified aircraft parachute system which enhances safety. You may purchase a flight using the Buy Now button below. The purchase is non-refundable and is valid for 1 year. The Hudson River introductory flight combines our standard introductory flight with the awe inspiring sights of New York City. Your route can take you over Newark International Airport, Staten Island or near Coney before heading North and up the Hudson River. Get an aerial view of the Statue of Liberty, the USS Intrepid museum, Central Park and more! Finally you will pass over the George Washington Bridge and head back to Morristown. 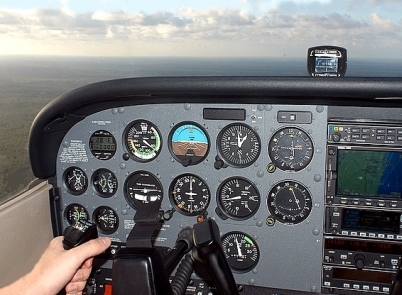 Introductory flights are for individuals that are new to aviation. One introductory flight per person is allowed. You can bring a friend at no additional charge. The purpose of the flight is to give a brief look at a real flight lesson. When booking, you will need to provide contact information for the individuals flying. A major credit card will be charged to secure your introductory flight. The introductory flight is non-refundable. The introductory flight may be rescheduled up to 48 hours prior to the flight lesson (weather permitting). Expect to arrive 15-20 minutes prior to reservation. Please bring a valid Passport or Birth Certificate and your Drivers License with current address. The Introductory Pilot will complete an enrollment application. You are allowed to bring one guest with you for the introductory experience. Logbooks may be purchased at dispatch. Guests of Certified Flyers may not film or photograph other aircraft on the Ramp at Morristown Airport (FAA & Airport Regulations). However, you may take pictures in front of our Certified Flyers aircraft. Weight Limits apply for pilot & passenger (if applicable) please contact 973-539-4080 for more information. There will be no guest on board below the age of 4 years old. Anyone under the age of 18 years old must be accompanied by a parent/guardian to sign release forms. (We recommend that minors be accompanied by adults during the introductory flight). Suggested items: sunglasses and camera. Flights cancelled due to weather or maintenance will be rebooked (must be cancelled by flight instructor only). If you show up late it will be deducted from your flight time. Cancellations are permitted 48 hours prior to reservation. It is customary to tip your instructor for an introductory flight. I had a great time with my lesson, I did not expect that I was going to take control of the plane as much as I did from assisting with the takeoff and flying and also the landing, I did not know I was going to do all these things. My instructor was very knowledgeable, cool and friendly, communicated effectively and very supportive.